We've continued our summer adventures this week. Gareth slept over at a friends house on July 4th, heading with them to the fireworks. The rest of us hung out at home. Mal was extremely excited that I bough a dead fish and told everyone we passed in the store that we had one. I've never cooked fish before, so this was definitely not in my comfort zone. I'd got a recipe for honey-ginger grilled salmon from a friend that looked simple enough, so decided to give it a try. The pin bones were surprisingly easy to find. I think I only missed two. Following the instructions from my friend, I cooked it under the broiler (aka upside down grill). I started out on low, was worried that wasn't doing the job, turned it to high and then got absorbed in my school work. So when I remembered it, it was a little blackened on top, but the internal temperature still wasn't there yet. I put some foil over it and cooked it on low a little longer. I had not idea if it was flaking easily, but the internal temperature was reading above safe levels, so I just hoped I wouldn't make any of us sick. Mal took one bite and decided he didn't like it and would stick with the hot dog we had wisely made up for him. Ryan and I enjoyed it though. Flavor was quite mild, though the ginger came out nicely here and there. A somewhat scary adventure, but one I'm willing to try again as I'd really like to force myself to like fish. The only problem is that this 1.5 pound fillet was gone in one sitting. Ryan eats so much that fish isn't often an affordable option for us. 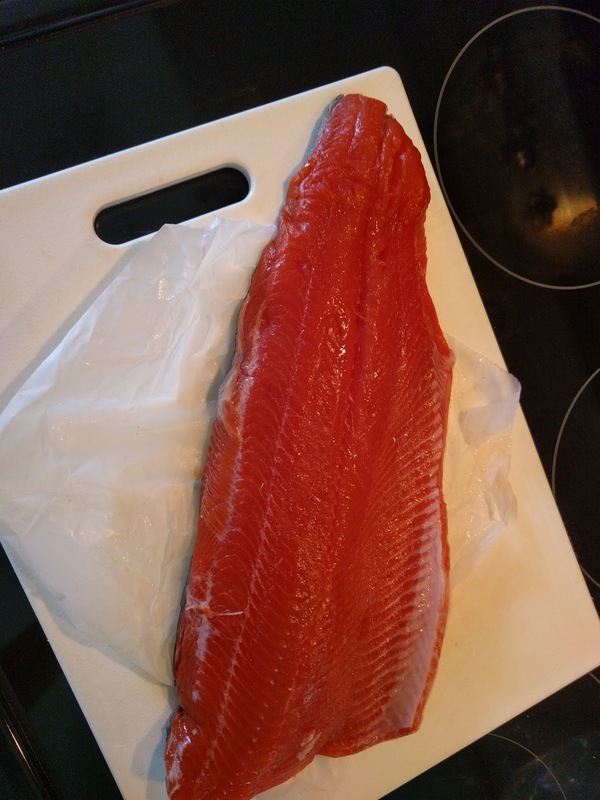 I only purchased and attempted this because the local store had fresh fillets on sale for less than $10/lb. Then we had my birthday, which wasn't very exciting. I spent it doing schoolwork. We had chicken and arugula salad for dinner. I wasn't in the mood for anything really for a dessert, so we just ended up giving the kids root beer floats and leaving it at that. Gareth had another orthodontist appointment this week, and found out that he'll get his braces off in one month. He's very excited about that as they've turned out to be not so exciting as he initially imagined they would be. Mal was very excited that they had the Bubble Man come to preschool during the week. That same day, Colin swung by with his daughter to hang out for a bit. Mal immediately asked for a ride on his bike, and Colin obliged, with a short spin up and down the street a couple times. Not as long a ride as Mal wanted, but Colin was going to have to ride home in the 80+ degree weather. It's weird to think that it's been two years since Colin watched Mal. And then Sunday, the boys and I got an invite from friends to join them for a movie (Despicable Me 3), so we headed down to the theater for that. 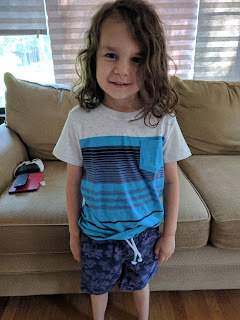 We actually got a second invite to join friends for Cars 3 that afternoon just before we left for the theater, but had to decline the invitation since we were going to be at the theater in a different movie already. The boys enjoyed the movie and I got them fries and a milkshake afterward. 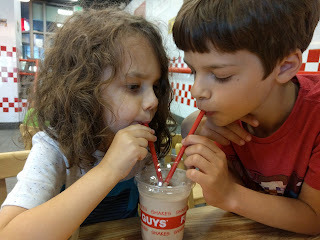 Turns out, the fries at Five Guys are ridiculously salty, so after trying a few, the boys just ate peanuts instead. The milkshake got much better reviews.